An AJ26 engine is placed in a test stand at NASA's Stennis Space Center. PARIS — Executives with Aerojet Rocketdyne, in its first week since forming from the merger of two rocket propulsion companies, said Tuesday (June 18) the new firm would save the U.S. government $1 billion over a decade and be responsive to the demands of customers, despite its dominance in the market for liquid-fueled rocket engines in the United States. Warren Boley, president and CEO of Aerojet Rocketdyne, said here at the 2013 Paris Air Show that the combined company promised the U.S. government $100 million in acquisitions savings per year in order to help achieve the endorsement of the Pentagon as officials sought approval for the merger, which was finalized on June 14.. The savings are vital to the sustainment of U.S. military and NASA satellite programs, which have been hamstrung by rising launch costs over the last few years. Boley said the company's commitment to $1 billion in cost savings over the next 10 years is being reviewed by two Defense Department contracting agencies. "We're willing to stand up and be counted on that [promise]," Boley said. Aerojet Rocketdyne officials also promised innovation and responsiveness to customer needs, despite concerns that competition would suffer with the merger of the two primary liquid-fueled rocket engine manufacturers in the United States. "Going forward, I want to have the ability to have a complete technology suite that satisfies all customers affordably," Boley said. "There are immediate affordability opportunites in our launch business in future technology. That's what is very exciting when you look at the launch portion of the Aerojet Rocketdyne business." One immediate test of Aerojet Rocketdyne's promise involves a dispute over the engines used on the first stage of the Orbital Sciences Corp. Antares rocket, which successfully launched for the first time in April. Antares is under contract to NASA for eight commercial cargo resupply missions to the International Space Station, plus an additional test flight later this year. Orbital hopes to win additional Antares launch orders from NASA, military and commercial customers. The Antares first stage is powered by two kerosene-fueled AJ26 engines supplied by Aerojet, which acquired the engines from Russia in the 1990s. The engines — known as NK-33s in Russia — were built in the 1960s and 1970s for the Soviet Union's N1 moon rocket. Aerojet imported the engines to support the company's U.S. propulsion business and modified each unit to gimbal, allowing the engines to steer rockets ascending from the launch pad into orbit. The upgraded engines under Aerojet's control are renamed the AJ26. But the NK-33 engine is not in production in Russia anymore. Aerojet Rocketdyne has an inventory of 43 AJ26 engines available for Orbital's Antares rocket — enough for 21 flights. Between 12 and 18 more NK-33 engines are stockpiled in Russia. "Orbital is currently pursuing a long-term first stage propulsion system for its new medium-class Antares launch vehicle," Orbital spokesman Barry Beneski said in a statement. "Orbital currently uses the Aerojet AJ26, which is derived from the Russian NK-33, and has a sufficient supply of AJ26 engines available to meet commitments to NASA for commercial cargo supply to the International Space Station." Aware of the finite supply of AJ26 engines, Orbital Sciences began inquiring about the purchase of RD-180 engines — then controlled by Aerojet rival Pratt & Whitney Rocketdyne — to support the company's long-term strategy of expanding the Antares market into medium-lift satellite launches and further cargo missions to the space station. RD AMROSS is responsible for U.S. sales of the RD-180 engine for United Launch Alliance's Atlas 5 rocket. An RD-180 engine and Atlas 5 first stage arrive at the launch pad in Florida. Lockheed Martin Corp., a ULA stakeholder along with Boeing Co., invested in the development of the RD-180 engine for the Atlas 5 rocket in the 1990s. ULA still maintains intellectual property rights to the engine, giving the Atlas 5 rocket exclusive access to RD-180 engines in the U.S. market. The Federal Trade Commission launched an investigation into the matter after complaints of "anti-competitive" practices made by Orbital against ULA and RD AMROSS. 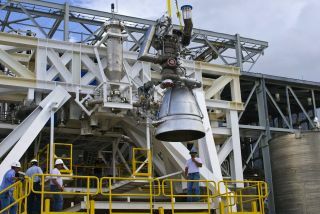 "Today, the only engine in active production that is technically suitable for the Antares and available for use in the U.S. is the RD-180 engine from Russia," Beneski said. "Orbital continues to investigate all potentially available engine options, one of which is the continued use of AJ26 engines, based on new production NK-33 engines." Aerojet Rocketdyne plans to close the acquisition of Pratt & Whitney subsidiary RD AMROSS later this year, after securing approvals from the Russian government. Boley said Tuesday that Aerojet Rocketdyne has a written agreement with the NK-33 engine's manufacturer, the Kuznetsov Design Bureau in Russia, to start production of the engine. If Orbital places places an order for more AJ26 engines by the end of 2013, Boley said new NK-33s could arrive in the United States for Aerojet upgrades by late 2016.